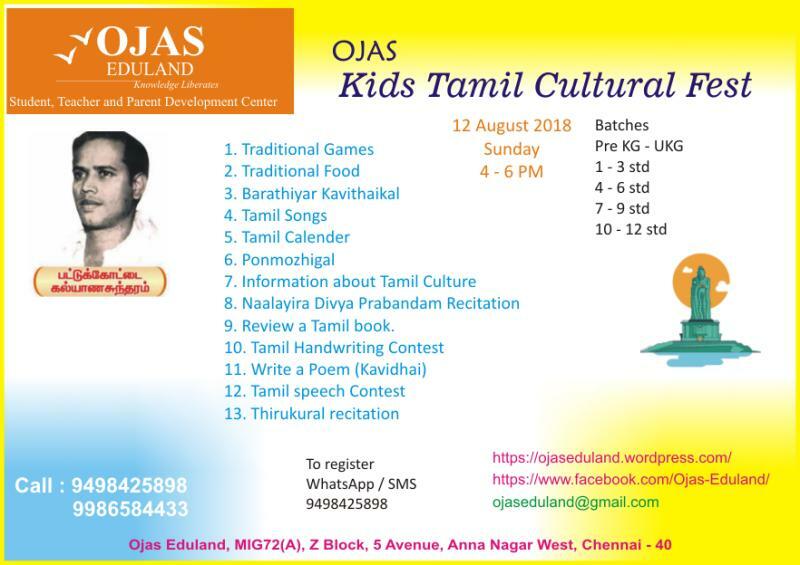 OJAS Kids Tamil Cultural Fest is an initiative by OJAS Eduland with an objective to nurture TAMIL CULTURE among kids. Events are designed in such a way to encourage kids to understand and learn Tamil culture. All the age group can participate in all the items. Dhayam or any other traditional Village games. Participants have to bring a play toy or Printed chart of the game (Quarter size chart). It can be a cut paste picture from any magazine. (Time : not to exceed 2.5 minutes). any other traditional Tamil food made from home and they have to explain about the ingredients and benefits of the food. Participants have to recite any Bharathiyar Songs. They have to submit the same in an A4 size paper. If needed, they can see the lyrics and recite. Participants have to sing any one of Kavignar pattukottai kalyanasundaram songs. If needed, they can see the lyrics and sing. Names of the seasons along with the month in which that season is coming. If needed, they can see the text and say. Participants have to explain and submit Tamil Ponmozhi (wise-words or proverbs) in an A4 size paper. If needed, they can see the lyrics and sing. Playschool – UKG : Say any 1 pon-mozhi and explain the meaning of it. 1st – 3rd std : Say any 3 pon-mozhi. Out of which 1 should be explained. 4th – 6th std : Say any 4 pon-mozhi. Out of which 2 should be explained. 7th – 9th std: Say any 5 pon-mozhi. Out of which 3 should be explained. 10th – 12th std: Say any 7 pon-mozhi. Out of which 4 should be explained. Participants have to bring an A4 size paper or printed poster with the information about any specific Tamil Culture. Participants have to bring a Tamil book and have to talk about the book in short. A topic will be given on the spot. Participants have to write a short poem (Kavidhai) in Tamil about the given topic. A paper for writing will be provided. Participants have to bring the writing pad & Pen / Pencil. Participants have to speak about Kavignar Pattukottai Kalyanasundaram.